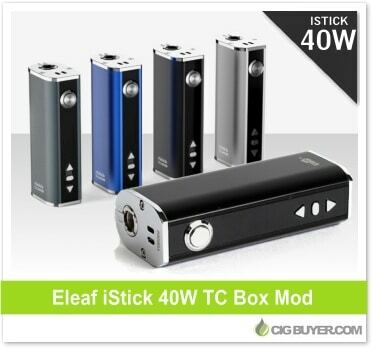 The new iStick 40W Mod builds upon the previous Eleaf iStick models, offering up to 40W of power with temperature control. Almost exactly the same size as the iStick 30W, the iStick 40W is more powerful and can also handle nickel Ni200 coils. It includes an internal 2600mah battery, OLED screen, stainless steel 510 threading and a spring-loaded 510 center pin. Other improvements include a rounded firing button and 3-button operation vs. two. * No special coupon code is available. Good while supplies last.